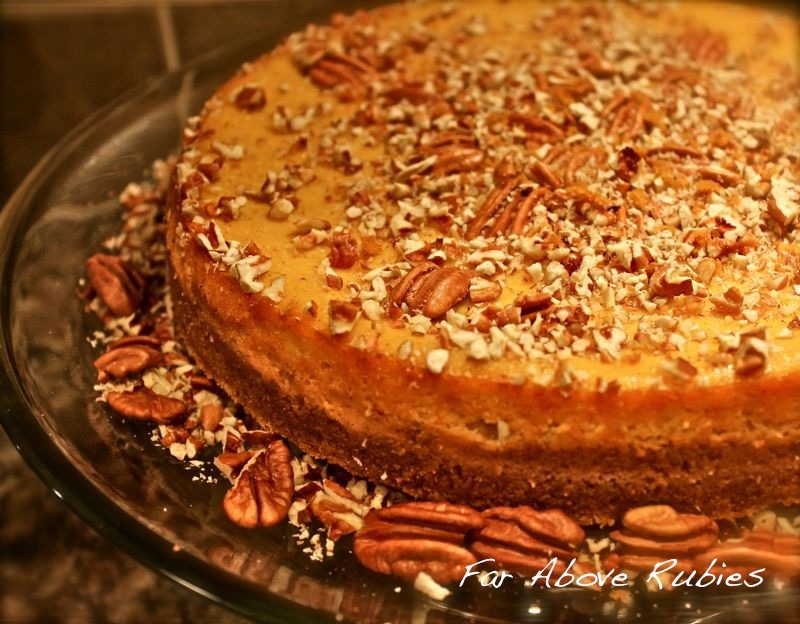 With all the holidays coming up, I wanted to share this recipe for Pumpkin Cheesecake because it is fabulous!! I have been making it for about 15 years and it is perfect and decadent! First combine the gingersnaps with pecans and butter. Press mixture onto the bottom of a 9-inch springform pan. Combine cream cheese and sugar, and beat with mixer until just combined. Add eggs, pumpkin, spices and rum flavoring. Beat on low speed until combined, then pour into prepared pan. Bake in 350 oven for 1 1/2 hour or until center is nearly set when shaken. Cool, then loosen edge of cheesecake from pan with knife or spatula. Remove sides of pan when cake has cooled. Cover and chill at least 4 hours. Top with chopped and halved pecans. **For my pie, I bake and puree a type of squash used in the south called a "Candy Roaster," which is richer in flavor than pumpkin. This makes the *best* pie, but if you cannot find that type of squash in your area, canned or pureed pumpkin will work. I'll link this up to "Foodie Friday" over at Designs By Gollum, so go by there for some great food!! Enjoy this one and have a wonderful weekend!! Oh this looks amazing! With the caramelized sugar & the glazed pecans, I bet it tastes more than amazing. Oh my gosh, this looks fantastic. Also, thanks for stopping by "my road" blog post. We are threatened with snow in this neck of the woods next few days ;( fall is over I am afraid. Looks so festive and yummy Anita, I will have to try it.Thanks for posting it! Anita, I made Pumpkin Cheesecake BARS the other day and the recipe was ALMOST identical! They were awesome! I also drizzled them with caramel AND chocolate ice cream sauces:):) OMGoodness!!! I will try your recipe too. Thanks for it. XO, Pinky PS I plan to post my bars on Sunday. This sounds fabulous! I love Cheesecake! Thank you for sharing. This looks so delicious ~ Now I'm craving it!!! Love your beautiful single!!! I'm so happy to know of your blog now, I'm your newest follower and I look forward to lots more visits!!! It sounds wonderful & looks beautiful!! I can't wait to give it a try...yum! !